Since I’ve been in college I’ve gotten into the habit of having a dinner party about once every semester. I usually use this as an excuse to cook for several days in preparation and to (attempt to) impress my friends with culinary delights. More often than not, I’ve ended up making Turkish food because it is easy and is always a crowd pleaser. This time, in addition to appetizers, I made Turkish beans, Turkish rice, salad, borek and cake. 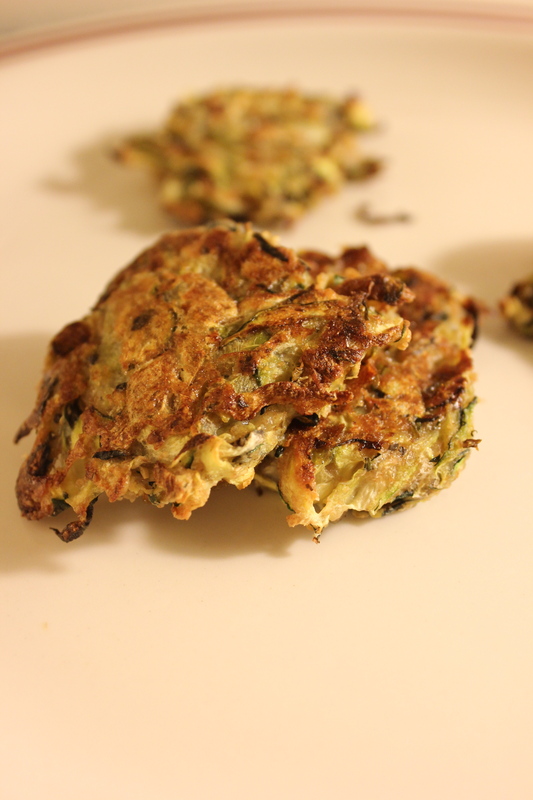 The last several times I’ve had a party I’ve made Mucver, or Turkish zucchini fritters, as an appetizer. For some reason this is always one of the most popular dishes – either than or my friends always lie to me about how much they like it- but I’ll just assume it’s because they are so delicious. 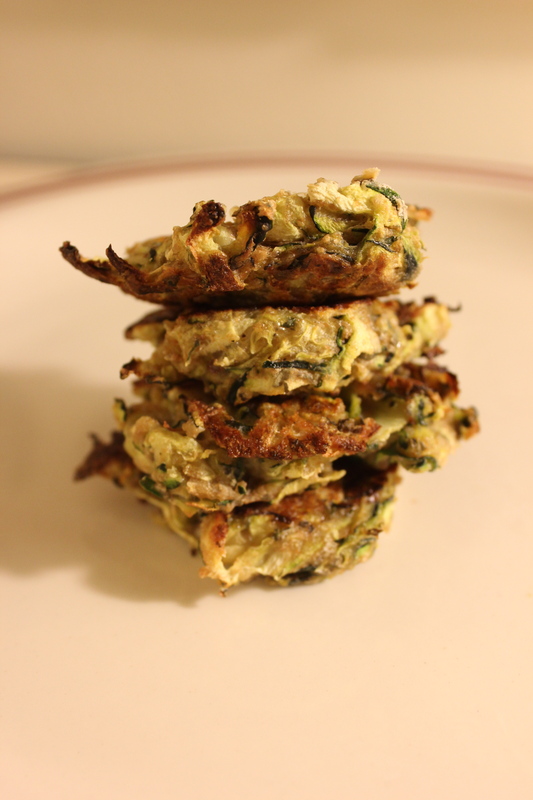 Traditionally, mucver are made by frying the zucchini fritters in oil, but I’m opposed to doing this because 1. why fry when you can bake and 2. I’m not interested in having an oil fire in my toy kitchen. So instead I bake them, besides this is easier than standing over a hot stove frying when you have 9 hungry guests waiting to eat. I will say that the last time I made them I actually made the mixture too wet, so what I tried to avoid is exactly what happened – I spent a good amount of time frying them up. But no matter, when you’re with friends you can be doing almost anything and still have a good time. Outside of the party chaos I’ve now actually made these with some care, so you can replicate the recipe, bake them in the oven and enjoy your guests while the appetizers are cooking up! If you like, you may add about a tbsp of crumbled feta to the mixture. 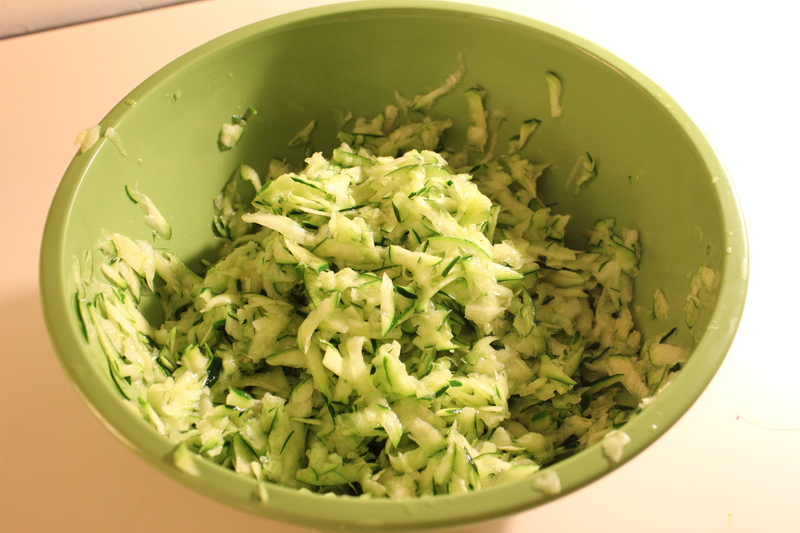 Wash your zucchini well and grate them into the bowl (keep the skin on). Take about a teaspoon of salt and sprinkle on the zucchini, then use your fingers to massage the salt into the zucchini. You will notice that the zucchini will start to release water – let sit for 15 minutes. While the zucchini is sitting, assemble the sauce by mixing together the yogurt, garlic and salt to taste. Set aside. Preheat the over to 400 degrees. Make sure your baking sheet is well-greased (I like to use butter but olive oil is probably fine too). 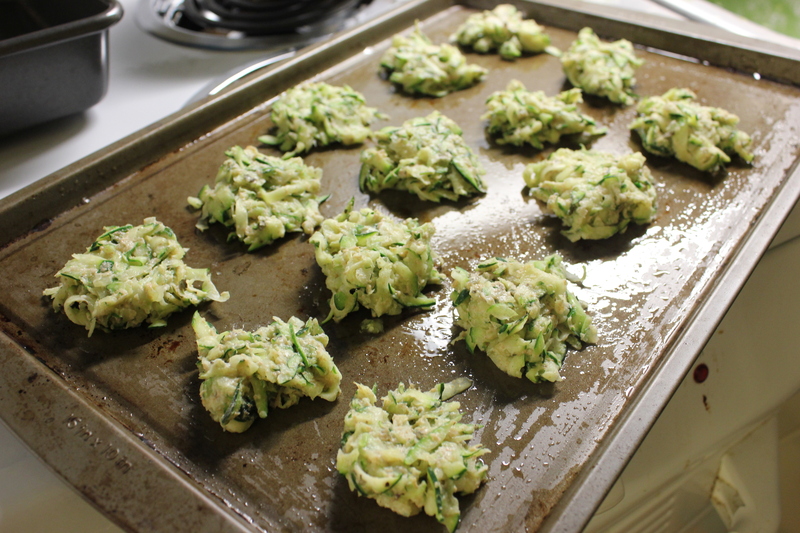 Be seriously liberal in greasing the baking sheet – keeping the fritters from sticking is what will save you. 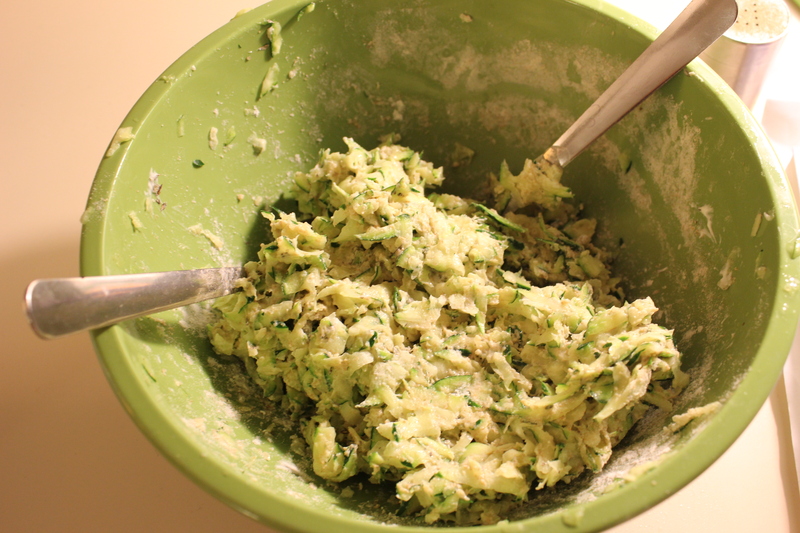 Once it has been 15 minutes, take zucchini and squeeze well. I like to place it into a paper towel and then squeeze the towel well so that all the water comes out. It should lose a significant amount of liquid. Place zucchini back into bowl. Add the yogurt, flour, parsley and pepper (and optional feta, if you like) to the zucchini. Mix well, if it seems too wet add a bit more flour. Using two spoons, drop small dollops of the mixture onto the baking sheet and flatten slightly (they will reduce in size as they cook). Place into the oven and cook for about 15 minutes. To get a really nice crispy outside, cook them on the lowest rack of the oven right above the coil of the oven – just watch them very carefully to make sure they don’t burn! Flip and let cook for about 5 minutes more, or until the other side is nice and crisp. Turn off the oven and let them sit inside for about another 5 minutes. Cool for 5 minutes and serve with yogurt for dipping!